that time of the day that seems to be another one of those things that preschool teachers 'just do'. I have really been pushing myself to be more purposeful in the classroom. Which means, taking a hard look at some of the things we do as early childhood teachers that we have always done or that every teacher does. One of these is calendar at circle time. Many teachers are doing away with the calendar at preschool circle time because young children don't quite understand the concept of time in days, months and years. We know this to be true because to a preschooler everything happened yesterday! So, if children don't grasp the idea of time why on earth spend time doing the calendar together? Overall, we are introducing the idea of what a calendar is and how it helps us, so that later when a calendar is present, children have schema for what is a calendar is. Do you have a calendar? 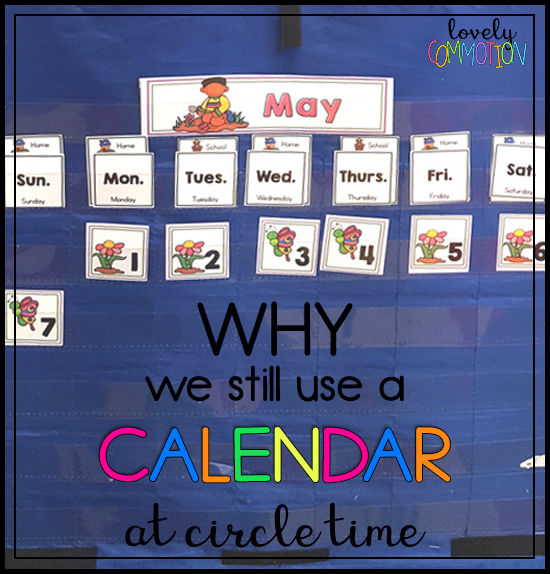 Do you agree with the use of calendars at circle time? Do you need a Patterning Calendar Set? Keep Preschool Circle Time Lively with these Quick Tips! Oh yes, Benjamin Franklin, you got it. When we don’t plan out our intentions in our classroom, we can easily miss the mark. Being intentional and goal-driven when planning is the key to being successful. Ever feel like you are just picking up activities from here and there with no clear path of where or what you are doing? You might need to get your plan on! 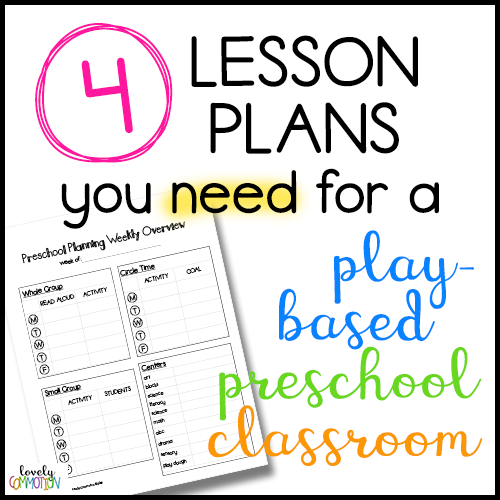 Here are the 4 Lesson Plans you NEED for your Play-Based Classroom (and a free printable)! Circle Time isn’t always a time that teachers think to plan. But, without planning circle time, you might find that you aren’t sure what to focus and what you have focused on. Planning circle time is quite an in-depth process, so much so that I have a free webinar and a course developed to help teachers plan this time to be a successful as possible. Shake it up! Don’t let your circle time get boring… if circle time is boring, children are not engaged and learning isn’t happening. Don’t just do the same ol’ songs, and activities each day. Consider what goals you are actually trying to meet with this time. Can you break those goals into two groups - core/everyday & add-in/just for a short time ? This may help you plan out what skills you might change out throughout the year. Less is more at the beginning of the year. Plan only a quick and easy circle time at the beginning of the year to help students build stamina. Later in the year more things can be added. Activity or Game: this might be a sequence or re-telling activity based on the read aloud. Or, we might do a class game, song, movement activity or experiment. Consider the amount of time that your students can sit at the carpet before becoming restless and plan activities and read-alouds accordingly. Make sure your activity is engaging and involves student interactions. Students will quickly become bored with your activity if they are not contributing in a hands-on way. Open-ended art invitation: is there a process art invitation that I want to set up that needs teacher assistance? Assessment: do I need to pull one student or a group of students to complete an assessment? Skill-Based Activities and Games: after assessments there may be a students that need a little extra practice in a certain skill. I can take this time to work with those students in a fun and engaging way. Name Writing: we do not do sign-in books (you can find out why here), so I take time individually with each student to learn the correct strokes needed to write their name. Planning centers? In a play-based classroom, much of the focus is on learning through play in centers. So, we must carefully plan the things we want students to learn in these centers. To plan centers, I list out all my classroom centers and list any changes/additions being made to the center that week. This does NOT mean that I completely change up a center- we still have ‘core’ materials in each center and what I add each week is in addition to these core materials. For example, our block center has core materials like blocks, cars, animals, etc. But, during our Dino unit I make sure to add toy dinosaurs and during our All About Me unit, I make sure to add blocks with student pictures added. Art Center: stamps, stickers, stencils, paper shapes, foam shapes different painting materials, different canvas materials (different types of paper, foil, wax paper, etc.) based on our current theme or season. Block Center: consider adding materials that students can build with or use as building accessories that reflects the current theme or season. Science Center: we change up our science center every month - you can learn more about what we cover in my Science Center Kit. Sensory Center: this center gets completely changed out based on the theme. For example, during our Winter unit, we use white rice, fake snow and polar animals. When we are in our Thanksgiving unit we use dry beans, craft feathers and little acorns. Library Center: each theme we add a different set of books based on the theme. We also have a tub of ‘favorite’ books that children love to read over and over! Math Center: we like to add familiar games that we have planned during small group into our math center for students to play independently. We also like to change out puzzles, manipulatives and tools. ABC Center: we like to add any alphabet games we have played through the week. We also like to change out the manipulatives to keep it fresh. Writing Center: add theme specific vocabulary cards and we change out writing center materials often to keep students engaged. *Get the FREE Guide to Preschool Centers here! Let’s lay it all out! I have a FREE Preschool Planning Weekly Overview for you in the Resource Library! Click below to sign up for the resource library and get this resource and many more! Already signed up for the Resource Library? Do you struggle with to keep your preschool student's attention at circle time? Are students distracted and un-engaged? These quick tips to keeping circle time lively might help! It is mid-year in your preschool classroom and it is time for circle time. You are feeling a little dread because circle time is not your favorite time of the day. It is supposed to be an engaging time to build a class community and review some core skills. But, anymore it feels just routine. Kids are rolling, pinching, picking and talking. < None of which are a part of your circle time plan. You started wondering why even bother with circle time. It seems like some 'right of passage' for preschool. But, you aren't feeling it. So, you do less and less of it. But, then you start wondering when you and your class are going to review some of those key skills like letter recognition or counting. There is small group time, but you feel like you need to do some review daily. You are also starting to miss that comradery that your circle time had at the beginning of the year. The class coming together and learning together - it can be such a powerful experience! Does this experience sound at all familiar to you? Are you ready to make some changes in your circle time routine to keep it a fun and lively learning experience? A circle time that lasts too long can result in negative behaviors from students. How long is your circle time? Do you extend the time frame as the year goes on? At the beginning of the year I like to keep circle time short and sweet at around 10 minutes. As the year goes on I extend the time as student's attention spans increase and by the end of the year our circle time is roughly 15-20 minutes (at most). Consider your physical space. Do children sit on one large rug? If so, could you take the proactive route and add names to tape and create designated spots for each child. Or, do children have their own carpet squares which help define their personal space? Sometimes considering the space you have for students to sit can help management issues. Hearing "He is touching me!" or "She is sitting where I want to sit!" stops when spaces are defined. Keep students involved in circle time by giving out jobs within your circle time. Like, a calendar helper, weather watcher or song leader. You can also keep students involved by encouraging conversation and asking for student input. Shake up your routine by changing it up. Decide some 'core' activities you plan on doing every day (like calendar, weather or greeter) and change up some 'add-in' activities. For example, you could add in an estimation jar activity, nursery rhymes or student surveys. Bring in different add in activities every several weeks/months to keep things fresh! I have found, after making some adjustments to my circle time that this time together can stay a positive learning experience with just a little bit of planning on my part. With an intentional plan in place my class is now rockin' circle time and loving every minute of it! 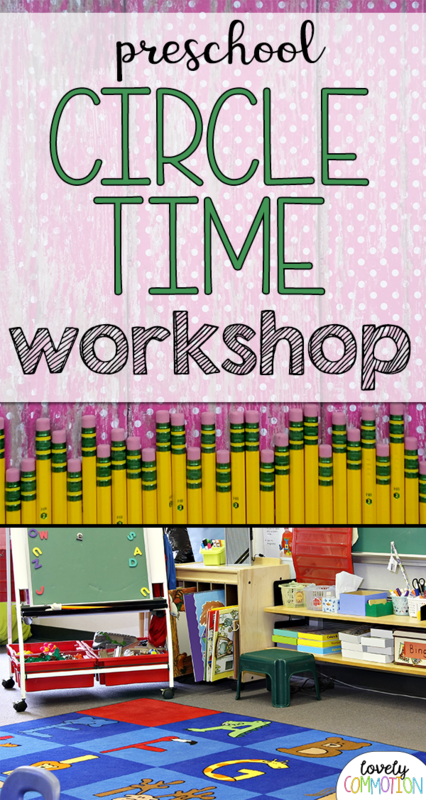 When planning out circle time for your preschool classroom, set-up of your space is a key component. Read on for more! So... planning is like one of my favorite things. Planning vacations, planning lessons, planning my year, planning for well...anything! Time and time again I use my summer to plan out my year. It just makes me happy. Are you a planner too? One thing I did last year is sit down and plan out my circle time set-up. I was in a new room and wanted to get the set-up right the first time. So, I drew myself a little sketch of where in the room I wanted my circle time to be. I knew that I needed to keep in mind the number of students I had to fit in the space and the number of distractions the space had. I sure didn't want my kiddos watching out the door while we were trying to do some serious learning together! I also didn't want my kiddos squished like sardines (can you hear the 'he touched me' whining that would be going on?). After lots of consideration, I put my circle time in a corner of my room. It actually worked out perfectly last year. Another thing I did in regards to planning out my circle time set-up was creating a sketch of where things were going to go on the board. I absolutely hate running out of bulletin board space just because I didn't take the time to think it all through. I split my circle time activities into 2 groups. 1- skills I wanted to cover the whole year (calendar, weather, counting) and I called these CORE SKILLS. 2- skills I wanted to cover for a short time or when children mastered the skills (colors, shapes, estimation) and I called these ADD-IN SKILLS. I knew that I needed room on my bulletin board space for items that were going to last the whole year (core skills) and a place for items to come and go (add-in skills). Of course while planning I made little sketches and some notes in my notebook. But, I love to create things for other teachers... so I created a 'Circle Time Set-Up' mini-workbook (if you will). This mini workbook provides you with ideas and things to consider when planning the physical space for your circle time. It also gives you space to sketch it out! Head to the RESOURCE LIBRARY to get these planning printables! Not a member of the resource library? Sign-up below - it's free! Plus, there are many more free resources inside- all in one spot! Bringing songs into your preschool circle time is not just fun. Songs help with circle time management and help children learn concepts through repetition. So...what songs should you be singing during circle time? Here is a list of 5 songs you should be singing at preschool circle time to encourage learning, establish routines and manage the time together as a group. 5 Songs You Need to Make Your Circle Time ROCK! You need to get your students wrapped up and transitioning from what they were doing into coming to the carpet and sitting down. I like to keep this song very repetitive so that kids can not only remember it, but also sing along. This song signals students to come and sit for circle time. You can find the 'Come Sit Down' song I use at this post (you will find lots of other transition songs there as well). A welcome song helps set the tone for the day. A welcome song should be fun, engaging and make children feel welcome! Below, you can find the Welcome Song we use (free printable) and an audio of the song - so you know how to sing it! The Weather Watcher Song signals the weather helper to get up from the carpet, look out the window and present the weather to the class. We all sing this song while the weather helper is looking at the window, which keeps children engaged in singing and not losing interest while waiting for the weather helper to finish his/her job. If you do calendar time within your circle time, Days of the Week Songs and Months of the Year Songs are a great learning tool. Reciting the days and months are much easier when put to a special tune. Monthly songs are a fun way to help children learn about the events and weather of a given month. I use my 'Song-a-Month' song ring (available here for free). We sing the monthly song everyday of that month. Also, at the end of the day, before we go home we sing a Goodbye Song. My kiddos just love this song! See the download below for the song printable and the audio file so you can learn the tune. CLICK BELOW TO GET THE WELCOME & GOODBYE SONGS FREE, ALONG WITH MANY MORE FREE RESOURCES!